Paragraph 79. 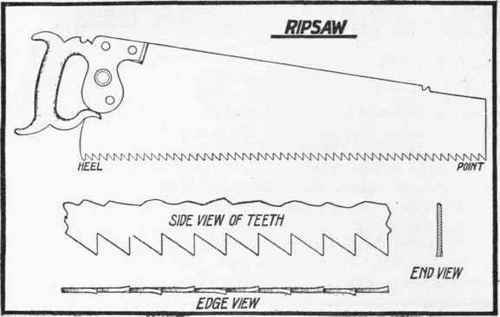 The following illustration (Figure 63) shows the appearance of the teeth of a rip saw. The size of the teeth is somewhat exaggerated so you may be able to recognize the essential features. At first glance you possibly would not distinguish the difference between the shape of these teeth and the teeth of a cross-cutting saw; therefore you must examine the illustration carefully, studying the appearance of the teeth from all the different views which are given. In order that saws may run easily, and cut a wide enough groove, or kerf, as it is called, to allow the blade to run freely, the edge of the blade which has the teeth is usually a little thicker than the back edge of the blade. The teeth also are given "set"; that is, half the teeth (alternating) are turned slightly toward one side while the remaining half are turned toward the other side. This plan of setting the teeth has the effect of enabling the saw to cut a kerf sufficiently wide for the blade to run through smoothly. Rip saw teeth are not given much set. However, they should have a little set, as shown in the end view of Figure 63. By examining a rip saw in the shop, noticing the set, the shape of the teeth, and experimenting with it, you will see clearly why it should always be used only for ripping purposes.